The city and county are working together to get water and sewer lines to mega resort and marina Island Gardens, under construction on city-owned Watson Island. Last week, without fanfare or a word of discussion, Miami commissioners approved an agreement with Miami-Dade County to bring public water and sewer service to 1050 MacArthur Causeway for Flagstone Island Gardens LLC. The move authorizes the city manager to negotiate and execute an agreement for water and sanitary sewerage facilities among Miami-Dade County, the City of Miami and Flagstone Island Gardens LLC. The vote was 3 to 1, with Francis Suarez out of the room at the time of the vote. Frank Carollo cast the only ‘no’ vote without comment. Mr. Carollo has been a critic of Flagstone and has voted and spoken against extending lease agreements because more than a decade had passed since the original agreement with little to no work on the project. The June 25 resolution says Flagstone Island Gardens LLC has leases on the property and has requested a tri-party agreement in order to get water and sanitary sewer services. The county has agreed to provide the services for the development. Numerous delays, including the economic slide and port tunnel dredging, have for years held back Flagstone’s plans. After 13 years of little to no work, Flagstone announced it had begun marine mitigation at the site May 22, 2014, which represented a formal commencement of work on the project, city officials confirmed. 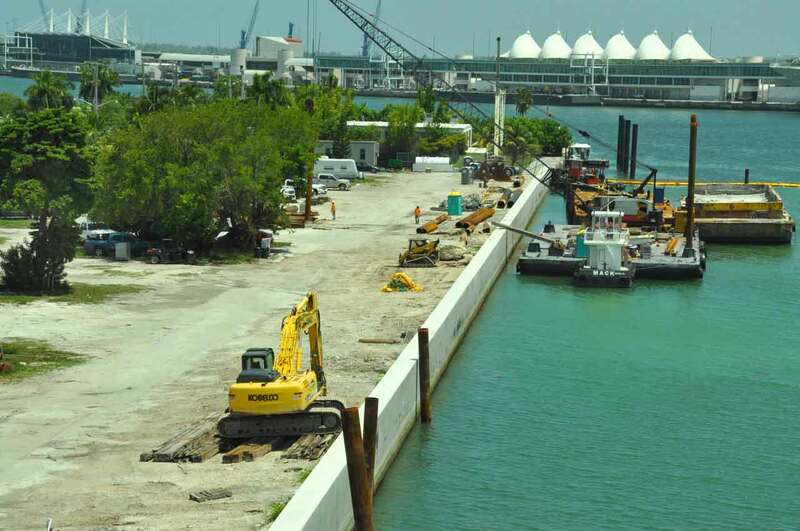 A new seawall has been built, along with dredging for the marina. The work has been accomplished amid litigation, Miami Beach elected leaders bad mouthing the project and community meetings where the developer’s lobbyist has defended the project in the face of critics. Some people simply don’t want it and say it’s too much development for the island, and will cripple traffic headed to Miami Beach and its offshore islands on the MacArthur Causeway. But Island Gardens is finally moving forward at a brisk pace, Brian May, representative for Flagstone, told directors of Miami’s Downtown Development Authority two weeks ago. He said a pier and docks could be open as early as Sept. 1, with the entire project finished in time for Art Basel 2017. The development is eventually to comprise a deep harbor for mega-yachts, a residential component, two hotels, 12 to 15 restaurants, floating docks, a small shopping mall including a fish market, and a 100-foot public promenade, Mr. May added. The developer, Mr. May said, is dredging 13 acres of bay bottom to gain enough clearance for the big boats and in September will begin the utilities. “We’re in negotiations with a unique anchor tenant and two hotel flags,” he said. He said the developer has invested millions to this point and the majority of the lawsuits against it have been dismissed.